QUESTION: Can you please comment on the following. I hear incessant talk about the market being supported by Bernanke. The Fed gets the credit for the market going up. (And when it goes down for not doing enough). How much truth is there in this mantra? How much is the Fed actually affecting stock prices by what they’re doing? It is very confusing to hear day after day CNBC commentators point to the fed as the cause for seemingly everything good and bad in the markets and economy. ANSWER: Absolute nonsense! The Fed is worried about the rise in the stock market for they are as confused as the talking heads. The talking head’s problem is this constant myopic view of the domestic economy as if everything begins and ends here. We are working urgently to get a new book on the globalization of the economy out ASAP that illustrates this problem that plagues not just the TV comments, but the economics taught in schools. The reason why increasing money supply by the Fed FAILED to produce inflation is the complete failure to comprehend the global economy. It is the global capital flows involving debt and capital investment that drives all world share markets and currency values. The Fed does NOT even control the money supply! International capital does!!!! There were secret meetings between central banks as early as 1927 that tried to deflect the capital flows pouring into the USA back to Europe. 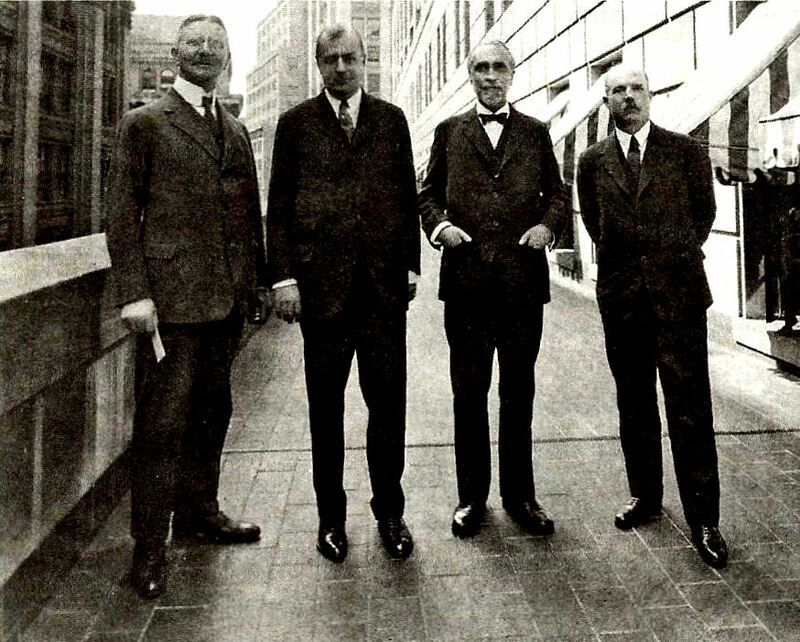 The central bankers of the day are pictured here and their efforts to manipulate the world economy utterly failed and caused capital to then really shift to the USA creating the bubble in 1929. They are not in charge of anything – they aggravate the capital flows. This is the same problem right now and the talking heads are clueless about capital flows and their importance. It was our seminar in London where the London Financial Times got in and reported on the front page that we warned Russia was about to collapse because we saw $100 billion in capital inflows with $150 billion in outflows. That forecast was correct and that sparked the collapse of Long-Term Capital Management in September 1998. They say if God did not exist man would create him just so he could sleep at night. We definitely view Washington the same – nobody knows what they are doing, but someone down there must, so the talking heads attribute everything to them. Sorry – the economy is on autopilot and this is just gibberish. Follow the money! If two Americans are involved and one sells Rockefeller Center to the other for $3 billion, there is no impact upon the domestic money supply assuming both were dealing in cash or the debt was the same. However, if the Japanese buy Rockefeller Center, they have to import cash into the domestic economy and that expands the money supply. The Fed had nothing to do with it. The US share market rises when there is a geopolitical or economic risk in Europe. In 1914, they shut the US share market for 4 months on fear there would be a massive selling panic on the outbreak of war in Europe. When the market opened, it rallied to the shock of the pundits. WHY? With Europe going to war, don’t you think you might want to move your wealth out of that place? The USA was broke in 1896. J.P. Morgan had to lend the US Treasury gold because it was near collapse. By the end of World War I, the US was the financial capital of the world. 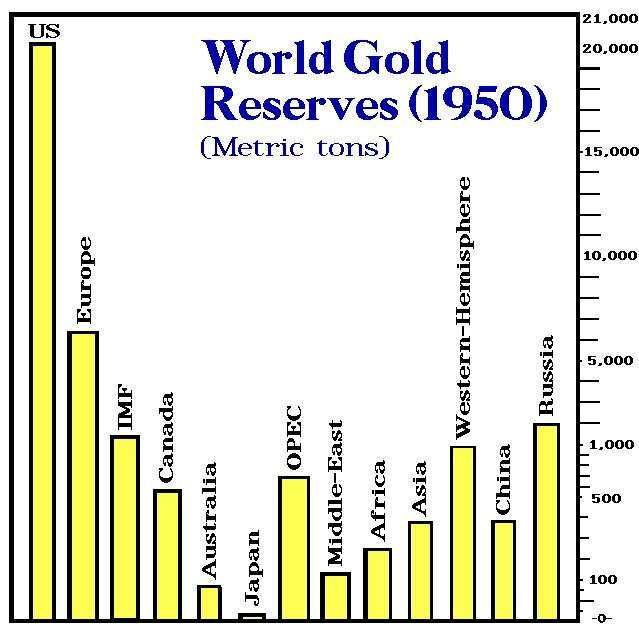 By the end of World War II, the US had 76% of the world gold reserves. Capital all flowed to the USA for fear of Europe concentrating in the dollar, which is why it became the reserve currency. 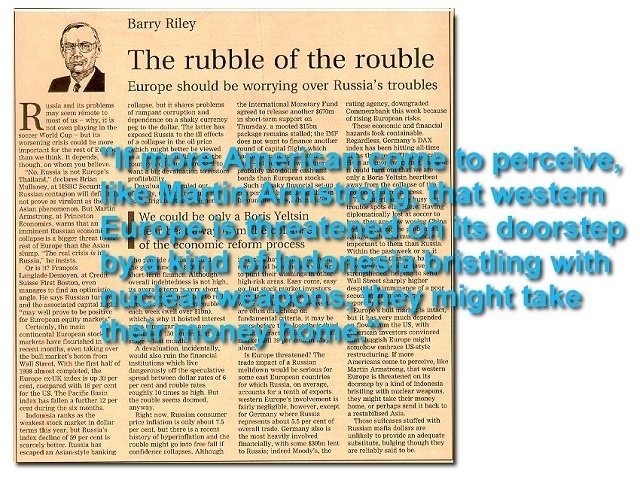 The press did not understand the globalization back then either and never will. They are journalists – not analysts. It is simply above their heads. What I have learned comes from our clients – not books and theory. You certainly would not go to a 5 year old for driving lessons in a car. If you have NO experience, forget it. Only live experience opens your mind to see the subtleties that are the key. It is the same with trading. Someone who has never traded has no clue about the craft. Everyone knew we advised the the majority of central banks after the 1987 Crash. A friend who did the intervention for the Bank of Canada came to my seminar in Toronto and brought about 15 members. Institutions began to ask me what the central banks were looking at. I would give the answer, and they would turn to see their reaction. When I was finished I said to my friend Pete from the central bank I hope I did not say anything that offended them. He said it was best speech he ever heard and wished he could speak like that to tell these people they did not look at half the nonsense they talk about. The central banks actually had phone lines connecting them. When I was there one day the phone rang. They refused to answer because they did not want to intervene. It just is not anything like what people think. When I would write to whomever, they responded because they knew we were serious.